The title page of the Jefferson Bible written in Jefferson's hand. Reads, "The Life and Morals of Jesus of Nazareth Extracted Textually from the Gospels in Greek, Latin, French & English"
The Life and Morals of Jesus of Nazareth, commonly referred to as the Jefferson Bible, refers to one of two religious works constructed by Thomas Jefferson. The first, The Philosophy of Jesus of Nazareth, was completed in 1804, but no copies exist today. The second, The Life and Morals of Jesus of Nazareth, was completed in 1820 by cutting and pasting with a razor and glue numerous sections from the New Testament as extractions of the doctrine of Jesus. Jefferson's condensed composition is especially notable for its exclusion of all miracles by Jesus and most mentions of the supernatural, including sections of the four gospels that contain the Resurrection and most other miracles, and passages that portray Jesus as divine. In an 1803 letter to Joseph Priestley, Jefferson stated that he conceived the idea of writing his view of the "Christian System" in a conversation with Dr. Benjamin Rush during 1798–99. He proposes beginning with a review of the morals of the ancient philosophers, moving on to the "deism and ethics of the Jews", and concluding with the "principles of a pure deism" taught by Jesus, "omitting the question of his deity". Jefferson explains that he does not have the time, and urges the task on Priestley as the person best equipped to accomplish it. In extracting the pure principles which he taught, we should have to strip off the artificial vestments in which they have been muffled by priests, who have travestied them into various forms, as instruments of riches and power to themselves. We must dismiss the Platonists and Plotinists, the Stagyrites and Gamalielites, the Eclectics, the Gnostics and Scholastics, their essences and emanations, their logos and demiurges, aeons and daemons, male and female, with a long train of … or, shall I say at once, of nonsense. We must reduce our volume to the simple evangelists, select, even from them, the very words only of Jesus, paring off the amphibologisms into which they have been led, by forgetting often, or not understanding, what had fallen from him, by giving their own misconceptions as his dicta, and expressing unintelligibly for others what they had not understood themselves. There will be found remaining the most sublime and benevolent code of morals which has ever been offered to man. I have performed this operation for my own use, by cutting verse by verse out of the printed book, and arranging the matter which is evidently his, and which is as easily distinguishable as diamonds in a dunghill. The result is an octavo of forty-six pages, of pure and unsophisticated doctrines. Probably you have heard me say I had taken the four Evangelists, had cut out from them every text they had recorded of the moral precepts of Jesus, and arranged them in a certain order; and although they appeared but as fragments, yet fragments of the most sublime edifice of morality which had ever been exhibited to man". 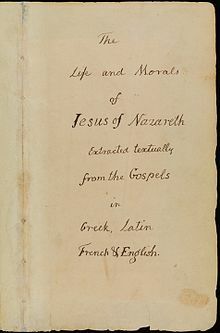 Jefferson never referred to his work as a Bible, and the full title of this 1804 version was The Philosophy of Jesus of Nazareth, being Extracted from the Account of His Life and Doctrines Given by Matthew, Mark, Luke and John; Being an Abridgement of the New Testament for the Use of the Indians, Unembarrased [uncomplicated] with Matters of Fact or Faith beyond the Level of their Comprehensions. Jefferson frequently expressed discontent with this earlier version. The Life and Morals of Jesus of Nazareth represents the fulfillment of his desire to produce a more carefully assembled edition. Using a razor and glue, Jefferson cut and pasted his arrangement of selected verses from the King James Version of the gospels of Matthew, Mark, Luke, and John in chronological order—putting together excerpts from one text with those of another to create a single narrative. Thus he begins with Luke 2 and Luke 3, then follows with Mark 1 and Matthew 3. He provides a record of which verses he selected, and of the order he chose in his Table of the Texts from the Evangelists employed in this Narrative and of the order of their arrangement. Consistent with his naturalistic outlook and intent, most supernatural events are not included in Jefferson's heavily edited compilation. Paul K. Conkin states that "For the teachings of Jesus he concentrated on his milder admonitions (the Sermon on the Mount) and his most memorable parables. What resulted is a reasonably coherent, but at places oddly truncated, biography. If necessary to exclude the miraculous, Jefferson would cut the text even in mid-verse." Historian Edwin Scott Gaustad explains, "If a moral lesson was embedded in a miracle, the lesson survived in Jeffersonian scripture, but the miracle did not. Even when this took some rather careful cutting with scissors or razor, Jefferson managed to maintain Jesus' role as a great moral teacher, not as a shaman or faith healer." Therefore, The Life and Morals of Jesus of Nazareth begins with an account of Jesus' birth without references to angels (at that time), genealogy, or prophecy. Miracles, references to the Trinity and the divinity of Jesus, and Jesus' resurrection are also absent from his collection. No supernatural acts of Christ are included at all in this regard, while the few things of a supernatural nature include receiving of the Holy Spirit, angels, Noah's Ark and the Great Flood, the Tribulation, the Second Coming, the resurrection of the dead, a future kingdom, and eternal life, Heaven, Hell and punishment in everlasting fire, the Devil, and the soldiers falling backwards to the ground in response to Jesus stating, "I am he." Rejecting the resurrection of Jesus, the work ends with the words: "Now, in the place where He was crucified, there was a garden; and in the garden a new sepulchre, wherein was never man yet laid. There laid they Jesus. And rolled a great stone to the door of the sepulchre, and departed." These words correspond to the ending of John 19 in the Bible. It is understood by some historians that Jefferson composed it for his own satisfaction, supporting the Christian faith as he saw it. Gaustad states, "The retired President did not produce his small book to shock or offend a somnolent world; he composed it for himself, for his devotion, for his assurance, for a more restful sleep at nights and a more confident greeting of the mornings." There is no record of this or its successor being for "the Use of the Indians", despite the stated intent of the 1804 version being that purpose. Although the government long supported Christian activity among Indians, and in Notes on the State of Virginia Jefferson supported "a perpetual mission among the Indian tribes", at least in the interest of anthropology, and as President sanctioned financial support for a priest and church for the Kaskaskia Indians, Jefferson did not make these works public. Instead, he acknowledged the existence of The Life and Morals of Jesus of Nazareth to only a few friends, saying that he read it before retiring at night, as he found this project intensely personal and private. Ainsworth Rand Spofford, Librarian of Congress (1864–1894) stated: "His original idea was to have the life and teachings of the Saviour, told in similar excerpts, prepared for the Indians, thinking this simple form would suit them best. But, abandoning this, the formal execution of his plan took the shape above described, which was for his individual use. He used the four languages that he might have the texts in them side by side, convenient for comparison. In the book he pasted a map of the ancient world and the Holy Land, with which he studied the New Testament." Some speculate that the reference to "Indians" in the 1804 title may have been an allusion to Jefferson's Federalist opponents, as he likewise used this indirect tactic against them at least once before, that being in his second inaugural address. Or that he was providing himself a cover story in case this work became public. Also referring to the 1804 version, Jefferson wrote, "A more beautiful or precious morsel of ethics I have never seen; it is a document in proof that I am a real Christian, that is to say, a disciple of the doctrines of Jesus." Jefferson's claim to be a Christian was made in response to those who accused him of being otherwise, due to his unorthodox view of the Bible and conception of Christ. Recognizing his rather unusual views, Jefferson stated in a letter (1819) to Ezra Stiles Ely, "You say you are a Calvinist. I am not. I am of a sect by myself, as far as I know." After completion of the Life and Morals, about 1820, Jefferson shared it with a number of friends, but he never allowed it to be published during his lifetime. The most complete form Jefferson produced was inherited by his grandson, Thomas Jefferson Randolph, and was acquired in 1895 by the National Museum in Washington. The book was later published as a lithographic reproduction by an act of the United States Congress in 1904. Beginning in 1904 and continuing every other year until the 1950s, new members of Congress were given a copy of the Jefferson Bible. Until the practice first stopped, copies were provided by the Government Printing Office. A private organization, the Libertarian Press, revived the practice in 1997. In January 2013, the American Humanist Association published an edition of the Jefferson Bible, distributing a free copy to every member of Congress and President Barack Obama. A Jefferson Bible For the Twenty-First Century adds samples of passages that Jefferson chose to omit, as well as examples of the "best" and "worst" from the Hebrew Bible, the Quran, the Bhagavad Gita, the Buddhist Sūtras, and the Book of Mormon. The Smithsonian published the first full-color facsimile of the Jefferson Bible on November 1, 2011. Released in tandem with a Jefferson Bible exhibit at the National Museum of American History, the reproduction features introductory essays by Smithsonian Political History curators Harry R. Rubenstein and Barbara Clark Smith, and Smithsonian Senior Paper Conservator Janice Stagnitto Ellis. The book's pages were digitized using a Hasselblad H4D50-50 megapixel DSLR camera and a Zeiss 120 macro lens, and were photographed by Smithsonian photographer, Hugh Talman. The entire Jefferson Bible is available to view, page-by-page, on the Smithsonian National Museum of American History's website. The high-resolution digitization enables the public to see the minute details and anomalies of each page. The text is in the public domain and is freely available on the Internet. In 1895, the Smithsonian Institution under the leadership of librarian Cyrus Adler purchased the original Jefferson Bible from Jefferson's great-granddaughter Carolina Randolph for $400. A conservation effort commencing in 2009, led by Senior Paper Conservator Janice Stagnitto Ellis, in partnership with the museum's Political History department, allowed for a public unveiling in an exhibit open from November 11, 2011, through May 28, 2012, at the National Museum of American History. Also displayed were the source books from which Jefferson cut his selected passages, and the 1904 edition of the Jefferson Bible requested and distributed by the United States Congress. The exhibit was accompanied by an interactive digital facsimile available on the museum's public website. On February 20, 2012, the Smithsonian Channel premiered the documentary Jefferson's Secret Bible. Jefferson textually corrects "out" into "up"
^ Tay, Endrina. "The Philosophy of Jesus of Nazareth". Monticello.org. monticello.org. Retrieved July 20, 2017. ^ R.P. Nettelhorst. "Notes on the Founding Fathers and the Separation of Church and State". Quartz Hill School of Theology. Archived from the original on 16 October 2017. Retrieved 16 October 2017. Thomas Jefferson created his own version of the gospels; he was uncomfortable with any reference to miracles, so with two copies of the New Testament, he cut and pasted them together, excising all references to miracles, from turning water to wine, to the resurrection. ^ Jefferson, Thomas, The Writings of Thomas Jefferson, ed. Lipscomb, 10:376-377. ^ Thomas Jefferson's Abridgement of the Words of Jesus of Nazareth (Charlottesville: Mark Beliles, 1993), 14. ^ Jefferson, Thomas, The Writings of Thomas Jefferson, ed. Lipscomb, 10:232-233. ^ Jefferson, Thomas (1830). Memori, Correspondence, and Miscellanies vol. 4. Boston: Gray and Bowen. p. 242. ^ Jefferson, Thomas. The Writings of Thomas Jefferson. Lipscomb. p. 14:232–233. ^ Randal, Henry S., The Life of Thomas Jefferson, vol. 3 (New York: Derby & Jackson, 1858), 654. ^ Reece, Erik (December 1, 2005). "Jesus Without The Miracles – Thomas Jefferson's Bible and the Gospel of Thomas". Harper's Magazine, v. 311, n. 1867. Archived from the original on February 18, 2006. ^ "The Book, Page 40 - The Jefferson Bible, National Museum of American History, Smithsonian Institution". ^ "The Book, Page 42 - The Jefferson Bible, National Museum of American History, Smithsonian Institution". ^ "The Book, Page 64 - The Jefferson Bible, National Museum of American History, Smithsonian Institution". ^ "The Book, Page 63 - The Jefferson Bible, National Museum of American History, Smithsonian Institution". ^ a b "The Book, Page 67 - The Jefferson Bible, National Museum of American History, Smithsonian Institution". ^ "The Book, Page 59 - The Jefferson Bible, National Museum of American History, Smithsonian Institution". ^ "The Book, Page 39 - The Jefferson Bible, National Museum of American History, Smithsonian Institution". ^ "The Book, Page 37 - The Jefferson Bible, National Museum of American History, Smithsonian Institution". ^ "The Book, Page 62 - The Jefferson Bible, National Museum of American History, Smithsonian Institution". ^ "The Book, Page 46 - The Jefferson Bible, National Museum of American History, Smithsonian Institution". ^ "The Book, Page 68 - The Jefferson Bible, National Museum of American History, Smithsonian Institution". ^ "The Book, Page 73 - The Jefferson Bible, National Museum of American History, Smithsonian Institution". ^ Hitchens, Christopher (January 9, 2007). "What Jefferson Really Thought About Islam". Slate. Retrieved January 24, 2007. ^ "Writing". Archived from the original on March 10, 2006. ^ "Humanists slice and dice the world's sacred texts - Religion News Service". Religion News Service. ^ "Humanists Create New 'Jefferson Bible;' Deliver Copies to Obama, Congress". Christian Post. ^ a b c G. Wayne Clough (October 2011). "Secretary Clough on Jefferson's Bible". Smithsonian Magazine. Archived from the original on 2013-04-08. Retrieved November 8, 2011. ^ Jefferson, Thomas (2011). The Jefferson Bible, Smithsonian Edition: The Life and Morals of Jesus of Nazareth. Smithsonian Books. ISBN 978-1-58834-312-3. ^ "Thomas Jefferson's Bible - The Jefferson Bible, National Museum of American History, Smithsonian Institution". ^ "History, Travel, Arts, Science, People, Places - Smithsonian". Wikimedia Commons has media related to Jefferson Bible. This page was last edited on 22 January 2019, at 01:08 (UTC).